for Windows XP, Vista, 7, 8, 8.1, 10, Server 2000. Dot matrix printers are not as popular among users as inkjet or laser printers, and that’s why it’s difficult to find driver Epson LX-310 printer. Many times even those users who have Epson LX 310 software CD are looking for the driver if they need re-installation of the printer. Therefore, on this page, we are providing Epson LX 310 driver download links compatible with Windows XP, Vista, 2000, win 7, 8, 8.1, 10 for 32-bit and 64-bit version operating systems. List of operating systems given below contains all the operating systems which are supported by this printer. From that list click on operating system link on which you want to install your printer. Before downloading please make sure if your operating system is 32 bit or 64 bit and only download the compatible driver. At any point, if you require any help, then kindly contact our support team. Driver incompatibility problems occur when you install unofficial drivers on your computer or you download the wrong type of driver like a 32-bit driver for 64 bit OS. Therefore, all the download links given on this page are from the official Epson website. It means you will only get genuine and fully compatible Epson drivers on this page. Windows 10 (32-bit, 64-bit), Windows 2000. Every printer driver has an installation manual which describes the right installation method of that driver for various operating systems. Therefore, before installing your new printer driver you should read its driver manual, or else, you can contact our experts who will then help you in driver installation. Before installing a new printer driver, you must properly uninstall old printer driver. Not doing this can lead to conflicts between the files of old and new printer drivers, which will, in turn, reduce the performance of your printer. 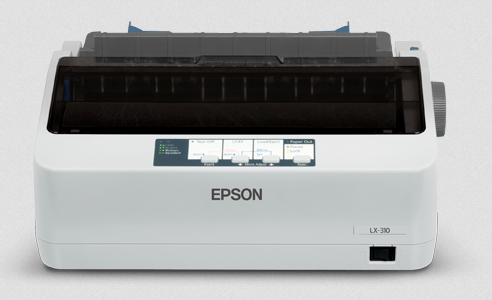 The Epson LX-310 is a dot matrix printer which has been designed to deliver highly reliable printing with better performance. This printer has the print speed of 357 characters per second at 12 CPI and 128 KB of input data memory, which is double that of its predecessor. This Epson LX 310 dot matrix printer uses one Epson Black Fabric Ribbon (S015632) cartridge which gives page yield of approximately 1200 pages. but this is not installed in my system. pls send or help me its full driver to installed this printer in my sytem. LX-310 drivers are already given in the download section above. If you need any further help so please explain your problem in detail, we’ll certainly help you.